The internal Computer-fan that I had lying around is connected to a Scythe Controller. Basically I took a 5 Volt power supply, soldered the wires to a switch and then from there to the fan-controller and connected the fan. It is also possible to solder the wires to a usb cable, however, the fan will not shut off when the computer is not shut down but in standby mode, So I would consider this carefully. Depending on temperature I can give it full boost or add another fan. In the lowest setting you can’t even hear the fan, but it gives a low cool breeze around the face. Don’t ask me for the holder of the controller and fan, I always put things together from findings and stuff that I have lying around, I can’t even give you a shopping list because some parts are 20 years and older … But with a little imagination you might come up with a similar solution. Let me know in a comment what worked for you! 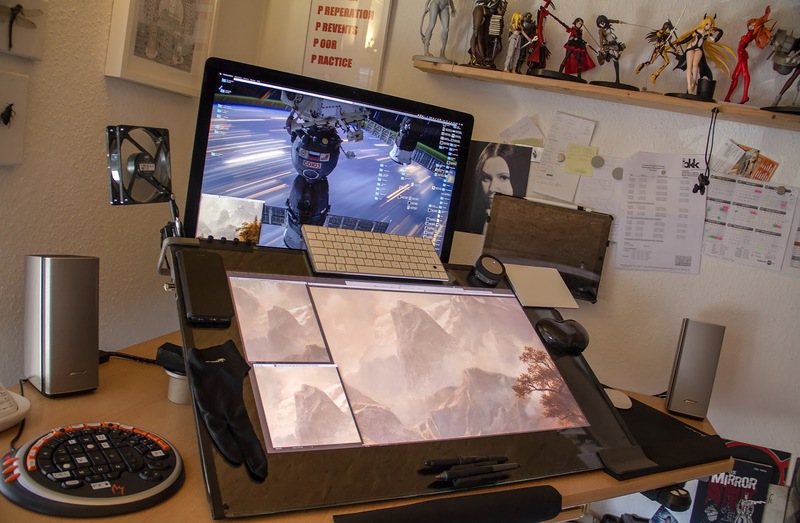 Who would have guessed that the empty space around the Cintiq 27QHD can be a nice ergonomic armrest? With double-sided tape I mounted the Trackpad, the handrest and a foamboard, matching exactly my arm-length. For tasks like scrolling websites, programming and switching between applications, this is definitely better than using the mouse, plus the ways are shorter to get there. Generally the trackpad is better to stay away from wrist-pain, but having an ergonomic place like this is better for longer stays and invites for a more healthy position throughout the day. What bothered me the most when using a Cintiq was the long ways necessary to put the pen away after work and the distance to grab it. This is especially bothering for short pauses throughout the day. In another version I came up with a magnetic solution. But with the trackpad armrest, this solution does not work for me anymore. So I came up with another foam-board solution. This even works for two pens, in my case the (customized) Art-pen and standard Pro-pen from Wacom. One thing that I used for a long time now is a custom keypad for working in Photoshop and Zbrush. For a long time I was a user of the Logitech G13 but after the OS X upgrade to Sierra it stopped working and there never came a working update from Logitech so the $90 device became utterly useless. As a new and cheaper replacement with even better keys (very silent) I found the Zykon K1 Keypad and instantly thought it was worth to give it a try. What could possibly go wrong for $10 bucks? With USB overdrive I assigned custom shortcuts and with a label-printer I taped the new keystrokes on the device as well. I’m not a fan of macros, I just want shorter ways for some shortcuts and the Zykon Keypad allowed me to just do that. What can I say, it works like a charm! With Autokotkey this can also work with Windows, for Mac OS USB Overdrive is a great recommendation as it can separate different devices and assign different keyboard settings by device. If you are interested, I can put up a list of keystrokes I assigned, but most can be seen from the photograph. This one seems to be a minor lifehack, but in everyday use it is a life-and-timesaver! Custom indentation or nothches to find keys blindly is a feature that gamers know and use a lot. In workstation and work-environments you search for keyboards with these features. With smallselfadhesive plastic buffers this solution is just a few fingertips away. On the custom keypad I know my hand is on the right keys without even looking, this guarantees to stay in the flow far longer. Since the Cintiq 27QHD is too big for effective use of the Ergotron arm, I misused my DIY tablet cradleto hold reference-books these days. This not only saves space, it is also a good light-shade on sunny days. Just kidding, but since I use books a lot for inspiration or technical research, it becomes handy often enough. The picture above is an old version, from the image on top you can see that the new version goes from edge-to-edge. That is because I ordered a custom glass plate to match my needs. In that old article are also some desktop tips, give them a read if you like. The reason for using a glass plate is that you are gliding faster over the surface which results in less wrist pain or none at all. I have some working sessions of 10-12 hours nearly in a row and have no ache. Another reason is that it prevents the Cintiq from scratches. I heard it should be a glass plate but yet I have 2 scratches on my Cintiq which gave me reason enough to use a glass plate. Windowmizer – Reduce open windows to just a header bar. This reduces distractions to a fraction, the Windows equivalent would be Winroll. This should not mean I don’t like to be distracted from time to time. When I don’t have conceptional work on my plate but render work that is often times hours of grinding through detailing, I watch Netflix or listen to Spotify music. But this is controlled distraction and helps to develop emotional connections with my work. Not every show or music does work though, but many do. I hope you found these tips useful. If you have your own desktop or ergonomics lifehack, don’t be shy and share them in the comments below. I love to learn and try out new things too.